I have been waiting to hold Amanda's new book in my hands ever since she announced that she was writing it! Visiting her blog is a lovely morning ritual I hate to miss. We share the same passion about so many things: family, nature, creating with our hands... and, of course, an appreciation for vintage finds. 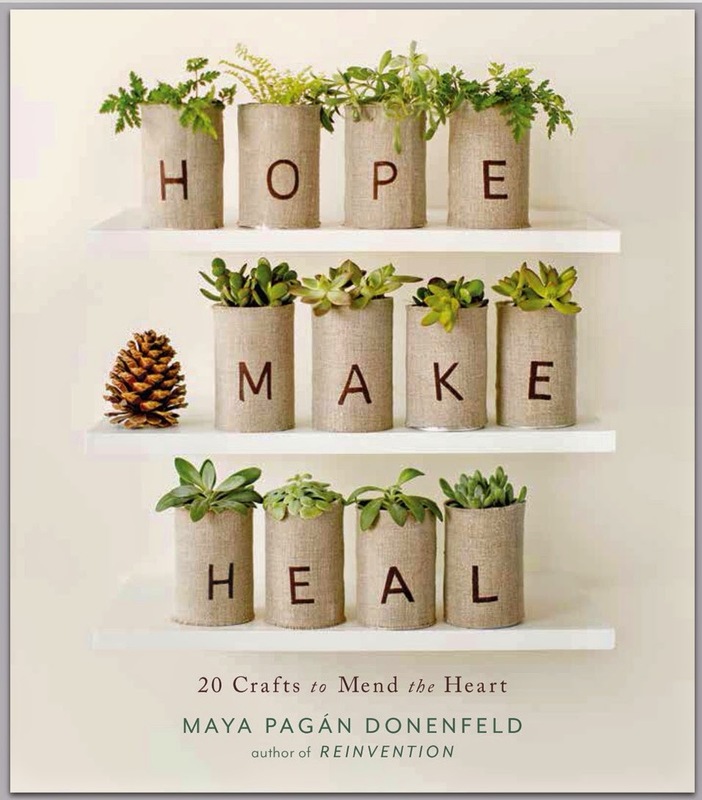 I read Handmade Home from cover to cover on the day it appeared in my mail box (more accurately: into the wee hours of the night). 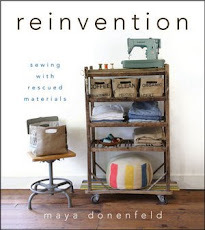 I love how many of her beautiful projects also fit a utilitarian purpose in the home. I'm always drawn to making something that will be used right away. Our bath mat had been bothering me for months... it had seen better days. I knew the towel rug would be the first thing tried. What I didn't know was what fabric and towel I would use. I let it percolate for a week or so and then had my aha! moment. A beautiful piece of Betz White's delicious organic fabric had been sitting on my sewing desk for almost a month. It had felt too special to cut. I have that problem sometimes. What if I made a bath mat out of it and didn't cut it? I was onto something! I then knew instantly which towel to use. I only had one of these IKEA polka dot hand towels, but they were such a nice match. I didn't hesitate. We enjoy baths in our home. A lot. This new mat has really been celebrated! I love how Amanda encourages you to use her patterns as springboards for your own creations. I didn't follow the exact directions in Handmade Home. I couldn't cover up any of that fabric. It was so quick and easy, makes me want to make one for the back door. High traffic areas deserve a little love and beauty, too. Thanks Amanda and Betz... you are both always such an inspiration! That is just about the prettiest little bath mat that I have ever seen!...you have such a good eye. 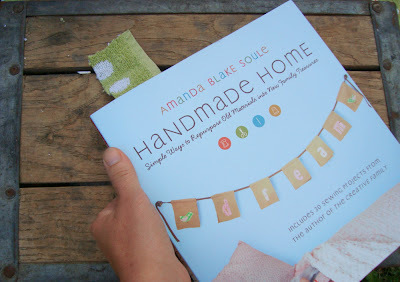 I am anxiously awaiting the arrival of my copy of Amanda's book—can't wait! Wow, Maya, it looks fabulous! 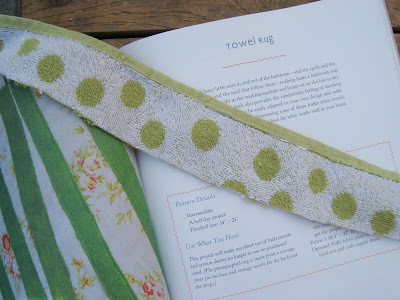 What a great idea and a wonderful match with the towel. I am telling you Maya.....you are just....magical! wow, I love that fabric too, neat idea! So cute. I love your diy attitude. You're one of my online heroes. When I grow up, I wanna be just like you... never mind that we're around the same age, that is not the point. Now if only I knew how to use a sewing machine. Dang it! I need another project like I need a hole in my head. And now you've done it. I don't have Amanda's book yet. I'm saving up Swagbucks points for Amazon giftcards and am nearly there. I already have a stack of sheets waiting to turn into a blanket. I LOVE your bath mat. Perfect colors! THat's one of the first projects on my list. 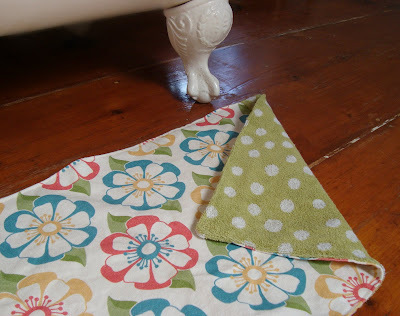 Yours is perfect: lovely fabric and polka dot towel. The combo couldn't be better. 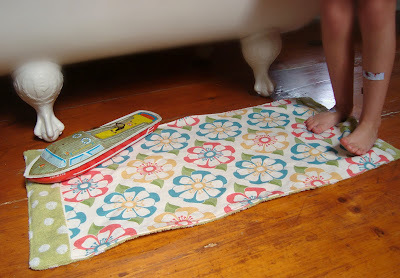 Oh - we really need another bath mat ...now I will just have to buy the book!! It looks great! LOVE it! So easy and effective! I ordered it AGES ago & it's still not here! Now I want it EVEN MORE! It's gorgeous!! What a fun idea! And great to combine the inspiration of Betz and Amanda!! Bathmat = awesome! It's so good to stop by again and see all that you've been up to. Always an inspiration. wow it's lovely! I'm going to make one too! You're suche an inspiration!!! so pretty and I have to say I'm jealous of the beautiful bath tub too! i just got my copy and can't wait to dive in! I love the way your mat came out, and that clawfoot tub...my dream!! how perfect! and although i only saw a tiny piece of your bath tub...i'm j-e-a-l-o-u-s! have always wanted one. what a lovely blog you have and i so enjoy reading it everytime. thanks.